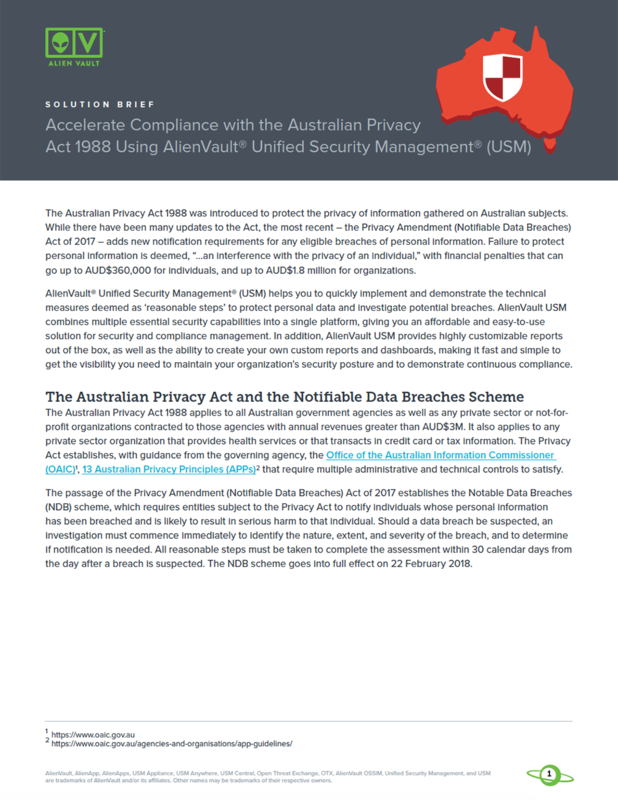 The Privacy Amendment Act of 2017 is the most recent update to the Australian Privacy Act 1988, and adds new notification requirements for any eligible breaches of personal information. Failure to protect personal information can result in financial penalties that can go up to AUD$360,000 for individuals, and up to AUD$1.8 million for organizations. As a result, IT security practitioners are now searching for ways to implement and demonstrate the technical measures deemed as ‘reasonable steps’ to protect personal data and investigate potential breaches. This solution brief explores the ways AlienVault® Unified Security Management® (USM) makes it fast and simple to get the visibility you need to maintain your organization’s security posture and to demonstrate continuous compliance. By providing highly customizable reports out of the box, as well as the ability to create your own custom reports and dashboards, AlienVault USM can help any organization accelerate their Privacy Act compliance program across their on-premises and cloud environments and cloud applications. Download the solution brief now to learn how you can accelerate your path to Privacy Act compliance.